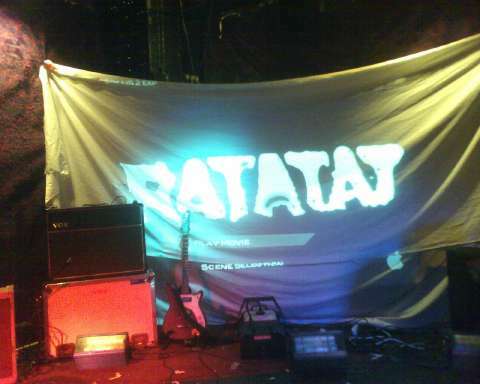 I just got home from Ratatat’s performance at The Earl in East Atlanta. Awesome awesome stuff. This band is phenomenal, from concept to execution, and they kick it ten ways live. I can now add Ratatat to the list of bands I’ve seen more than once. Hoorah. I would have liked to record the show, but my dinky Maxell voice recorder for iPod was overwhelmed the sheer amount of volume as was themodernista. I got nothing but noise and static from it. Hopefully, I got some decent pics from my cell phone (i doubt they’re that good though), but it’s late now and I’m off to bed. The show was fronted by Panther and The Envelopes. * coined by themodernista at the show.